When I hear Judy Collins singing the strains of the City of New Orleans, I get a sad feeling, reminiscent of other waves of emotion that periodically roll in from my youth--feelings about things no more. The song is about trains. More than that, it is about the beginning of the end for the passenger train, and for an industrial age on the wane. But it is not just about any train, it is about an elite train with a name, passing trains and towns that have no names. Oh yes--railroads clearly had a pecking order. But, in the caste system that defines a train's relative position on the social scale, the Skylands can brag of having more than its share of premier rail-lines and luxury trains. For those of my generation (especially males for some reason), the steam locomotive, with all of its power and thunder still inspires awe, and its memory remains forever imprinted on the brain. But, for a generation younger, the puffer-belly has slid into the ranks of museum fodder--though some of the more observant younger folks may still remember when New Jersey trains had names. Lines weren't just NJ Transit, Conrail, and Amtrack; but there were many individual companies--companies like the Central Railroad of New Jersey (CNJ); Lackawanna; Lehigh; New York, Susquahanna and Western (NYS&W); Lehigh and New England (L&NE); Pennsylvania (PRR); Lehigh and Hudson River (L&HR). Each had its own character and personality, and shared one thing in common--they regularly worked the hills and valleys of the Northwest New Jersey Skylands. One of two great viaducts, engineering miracles of 1909, emerges from the Jersey side of the Delaware where it broods over Rt. 80, at Columbia and stretches like a prehistoric skeleton across the river to Slateford, PA just south of the Water Gap. This and the Paulinskill viaduct 5 miles up the line at Hainesburg are astounding reminders of a magnificent era in Northwest New Jersey. There were "crack" trains too--elite trains with names (crack had a different meaning in those simpler times). CNJ ran the Queen of the Valley, the Lehigh had the Black Diamond, the Lackawanna had the Phoebe Snow. Some of these trains ran as recently as the 50s and 60s, but virtually none survived the painful period of decline and consolidation brought about by shifts in technology and the accompanying fall-off of rail traffic. Going back even further in time to the last half of the 19th Century, and the very beginning of the 20th, there were other railroads too. Railroads that, in their own time, became victims of a different form of consolidation born of the rapid expansion during the heyday of steam. The Belvidere-Delaware (Bel-Del), Morris & Essex, Warren, Sussex & Warren, and others all played an important part in the mosaic of the Skyland's rail history. The Skylands are strategically situated between New York City and the coal fields of Pennsylvania. The area is also sandwiched between one-time key industrial centers such as Chicago, Buffalo, and Paterson. Because of this coincidence of geography, the Skylands became the path of choice for numerous railroads, and many towns owe much of their early prominence to the age of steam. In the Skylands, towns like Phillipsburg, Washington, Blairstown, Oxford, Hainesburg, Sparta, Bound Brook, Netcong, Port Morris, and others, were all key locations for the railroads. But, as the importance of coal declined, and as electric refrigeration replaced the need to cut and ship ice to New York City from the Poconos and places like Lake Hopatcong, traffic began to fall off. Cars and trucks also siphoned off both passenger and freight traffic. In all, these shifts signaled bad times for the railroads. Some of the more interesting lines-of-old have been preserved for recreational use. The PRR line (actually the old Bel-Del) from Frenchtown to Trenton contributes about 25 of the 67 miles of hiking trails for the D&R Canal State Park. Also, thanks to the efforts of the PaulinsKill Valley Trail Association and the popular "Rails to Trails" movement, the PaulinsKill Valley Trail which runs 26 miles from Sparta Junction to Columbia along the abandoned rail bed of the NYS&W, has been reclaimed for hikers and bikers. Portions of this line also hosted trains of the Lehigh and New England (L&NE) and, for someone with a good eye, it is still possible to see remains of the wreckage of a 50s-60s freight derailment of the L&NE near PaulinsKill Lake. Other lines offer artifacts too--one hundred year old bridges of many descriptions, mileage markers, ruins of freight and passenger stations, signal towers, and old rail ties. There are also a few ruins of "armstrong" turntables around for the curious. These were manual turntables that were used to get locomotives turned around for a return trip. The term "armstrong" is apparently a tongue-and-cheek reference to the manual aspect of making the engine pivot--not an easy job. There are other rail-trails in the Skylands too. The Berkshire Valley Trail near Lake Hopatcong, the Black River Trail in Chester Township, the Capoolong Creek Trail between Pittstown and Landsdown, the Hamburg Mountain Trail between Ogdensburg and Franklin, the Pequest Trail in Pequest, the Sussex Branch Railroad Trail between Branchville and Andover, and the Traction Line Recreation Trail in Morristown. Artifacts are everywhere. The "hollow" concrete bridge over the PaulinsKill at Hainesburg and its companion bridge across the Delaware became the main line of the Lackawanna soon after the turn of the century, by-passing a slower and more painful route through Washington, Oxford, Butzville, Manunka Chunk and Delaware (NJ). The by-pass route was only about 11 miles shorter then the older route, but the infamous tunnel at Manunka Chunk frequently flooded and was too narrow for some of the larger engines of the day. (Buy a topographical map of the area, and see if you can find the Manunka Chunk and Oxford tunnels.) The junction of Rt. 46 and 31 in Butzville is also an intriguing area to explore. Look closely and see if you can figure out the complex interplay between the lines of the Lackawanna (old route) and the L&HR. Add in the history of the "Old Bel-Del" and you have some interesting reading and exploring ahead of you. In the early part of this century, roughly 10 railroad bridges spanned the Delaware River between Phillipsburg and the Delaware Water Gap --mainly to retrieve coal from the Lehigh and Susquahanna Valleys of Pennsylvania and to speed passengers to and from points west. Some of these bridges still stand--others require exploration to find the remains. For example, all that is left of the L&NE bridge at Columbia, and the NYS&W bridge, just north of the R t80 bridge at the Water Gap, are the abutments. On the other hand, one of the old Lackawanna spans in Delaware (NJ), built in 1904, still remains, as does the turn-of-the-century concrete Lackawanna by-pass bridge just south of the Gap. In fact there has been a recent bond-issue, and much talk, addressing the re-acquisition of this right-of-way for future train service from Stroudsburg, PA to NYC. While there have not been regularly scheduled trains on this route since 1970, an observer is offered many reminders of its past existence. Similarly, along the NYS&W route, for the most part abandoned since 1961, there are still mileposts with railroad hieroglyphics like JC 42 (42 miles to Jersey City). The town of Phillipsburg , which is next on my personal list for exploration, has had several Delaware crossings over the years, as it was a junction point for the CNJ, Lehigh, Pennsylvania and Lackawanna railroads. Other lines too, like the Reading, regularly crossed at this point, and it is still a popular place for railfans to converge to take photographs. If searching out the past while getting a little exercise appeals to you, there are several ways to start your own explorations:* Obtain topographical maps of the area (preferably older ones--although the current ones show many abandoned railroad lines). These are available at sporting goods stores catering to hunters and fishermen. Buy a copy of Railfan & Railroad Magazine (available at model railroad hobbyist stores and larger magazine stores). Here you will find references to many publications and historical groups that can help in your search. Contact the Rail-to-Trails Conservancy and keep up with the current status of other trails. Contact the PaulinsKill Valley Trail Association to obtain information and maps about the PaulinsKill Valley Trail. Talk to folks in their 70s and 80s. Capture their stories while you still can. Talk to the sons of those railroad porters and engineers, and the mothers who cradled their babes. Capture those stories. Fortunes were made and fortunes were lost in the age of steam. Like the coal mines that spawned many of the railroads, entire families derived their sustenance from the railroads. Futures of entire towns and cities depended on slight variations in traffic and circumstance. The stories could not be better, had they been fiction. Seek them out. John Smith is a fledgling railfan whose interest in railroading was born in the 40s in Bayonne, NJ where he lived on 1st Street, just a railroad toot from the busy 8th Street Station of the CNJ, and within sight of the sparks of the Staten Island Rapid Transit (SIRT). 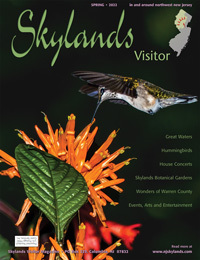 Extensive hiking, birding, and canoeing in the Skylands has fed this interest for many years and it has now surfaced in a new dimension. The author would be very interested in any railroading stories that you might uncover.